Milzkalns gift cards – is healthy and sporty gift! This will be suitable for all your active brothers, sisters, friends, parents and other outdoor adventurers! 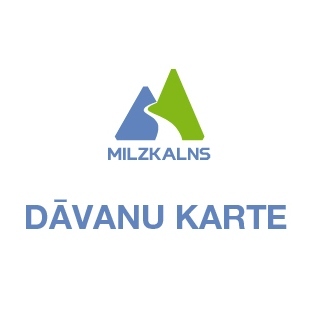 Gift card for 10 €, 20 € or 50 € now can be purchased online or as usual at Milzkalns tickets office during all working days or on off season please call +371 26222333 or write info@milzkalns.lv. Gift card can be used in winter as well as in summer. Everybody knows that while skiing and snowboarding you're taking some risk. To avoid that, we have developed track usage regulations that are available by the ticket office, on the stands all around the slopes, in our webpage and in other visible places. But. It takes some to time to read them through, so we believe that only some most diligent clients have read them. To make life easier for everyone, we have created a video presentation of both the security recommendations and track usage regulations in Milzkalns which are useful to those who are our regular clients and to those how are in Milzkalns for the first time. Take the highway Riga-Ventspils A10. Before reaching the Jūrmala toll booth turn right and keep going in the direction of Ventspils. After you've covered about 30 km, there will be a turn to the right in the direction of Smārde. Take this turn and go on driving, crossing the railroad and keeping on moving until you face a T-junction. You should turn left to go in the direction of Tukums. About 200 meters into the village 'Milzkalne' area, on the left side of the road you'll see a sign pointing RIGHT in the direction of Milzkalns - follow it. In a while, the "Milzkalns" sign will appear again on the left side of the road. Follow the unpaved road and keep going until you reach the skiing trail.